Home / Company / Bolzoni Auramo Inc.
BOLZONI AURAMO Inc. is active in the design, production and distribution of a full range of lift truck attachments and industrial material handling equipments for the U.S. market. The latest production methods and technology together with personnel expertise allow BOLZONI AURAMO Inc. to adapt to the most various and demanding customer requirements. BOLZONI AURAMO Inc.’s commitment to always provide the most suitable product and handling solutions for our customers over the years has resulted in close cooperation with all the main fork lift truck manufacturers. BOLZONI AURAMO Inc. supplies a wide range of products including integral and hook-on sideshifters, fork positioners, paper roll clamps, bale clamps, carton clamps, push pulls, multi-pallet handlers, rotators and forks. The company was founded in 1989 in Chicago, Illinois, when the Italian parent company BOLZONI, manufacturer of forklift truck attachments and OEM products, decided to open a new production plant in the U.S. to meet local market requirements. In 2001, the product range available on the U.S. market and sold by BOLZONI AURAMO Inc. was given a further boost following BOLZONI’s acquisition of the Finnish Group AURAMO, specialized and recognized worldwide for the forest and paper industry products. 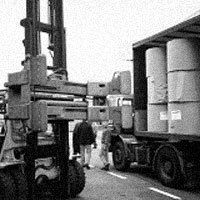 In 2002, the acquisition of the well-known American brand BRUDI located in Houston, Texas, pioneer and market leader in palletless handling attachments worldwide, also added new products to the range and further strengthened BOLZONI AURAMO’s presence on the US market. In the same year, BOLZONI AURAMO Inc. expanded to new facilities in Homewood, Illinois, increasing its local production volumes and product mix. BOLZONI AURAMO Inc. has also benefited from the launch of new fork product lines in Italy (2007) and China (2012) providing the world market with a complete range of forks for lift trucks, construction and agricultural material handling machines. Since its foundation, in close cooperation with its customers, BOLZONI AURAMO Inc. has continued to grow, becoming an essential business partner in many industries including paper and pulp, lumber, recycling, plastics, metals, food and beverages, fishery, pharmaceutical, logistics and any general handling. BOLZONI IS ONE OF THE WORLDWIDE LEADING MANUFACTURERS OF LIFT TRUCK ATTACHMENTS, FORKS AND LIFT TABLES, WITH THE MOST EXTENSIVE PRODUCT RANGE IN THE MARKET. The BOLZONI Group has been active for almost seventy years in the design, production and distribution of lift truck attachments and industrial material handling equipments. The constant attention paid to research and development, technological innovation, the synergy between the strategic and organizational capabilities of a large group and the local production and sales needs, enabling us to meet the expectations of each territory, has contributed to the Group’s expansion worldwide. Today, the BOLZONI Group is present globally thanks to 20 direct branches with over 1500 employees and independent dealers covering all continents, holding a leading position in lift truck attachments market. The Group offers a wide range of products utilized in industrial material handling, in particular lift truck attachments, forks and lift tables.